and has the freedom to style the look as she pleases. Add that philosophy to sewing for a pre-teen girl and you can understand that sewing for my granddaughter has changed. She no longer leaves all the design of the clothing I make her to me. She NOW actively participates in the process. I "harvested" the fabric from a soft, somewhat transparent, tye-dyed beach wrap to make this top.I loved the drapey quality of the fabric and how the colors just flowed from one hue to another. I knew I would have to line the blouse for modesty sake, but it was worth it. AND my granddaughter loved it too. 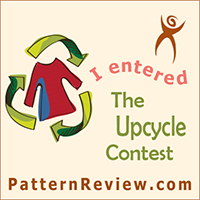 First, I use the Hazel Blouse pattern from Petite Stitchery. It's part of their new Boho Collection. 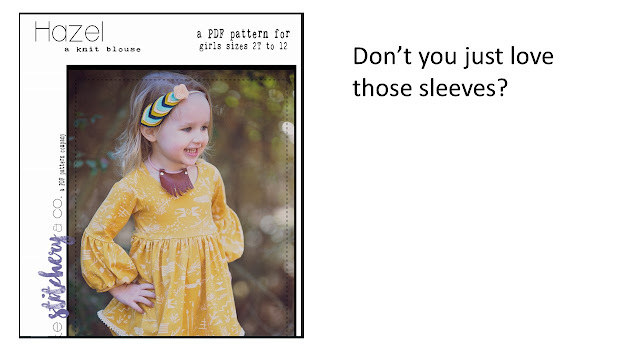 I loved those sleeves, but my pre-teen did not. "I just want short little sleeves, like the shirt I showed you," she explained. "But these are so beautiful and romantic," I argued. I wanted those sleeves, so I made it that way anyway. I figured that once she put it on, that she would love them too. So in the end... I cut them off and created a small cap sleeve... but I yearned for those sleeves, and ended up creating this matching purse made with the cut off sleeve. (so I guess we both won.) I just sewed the sleeve band together, and then created a bottom with a piece two pieces of stiff felt. I think together we created an unique, edgy yet feminine look. I added a zipper in the center back since this pattern was designed for knits. That was an easy adaptation, as I just did not place the back pattern piece on the fold and added a seam allowance for the zipper when cutting out the pattern piece. I changed this purchased flower headband to include flowers that pulled the red-purple color fro the top. Since my flower was just too big, I pulled the flower apart and just used the petals on the headpiece. Very cute! Such a fun way to adapt the pattern! It is a beautiful crafted pattern that goes together so nicely. Cute top, headband & purse! Isn't it just so fun being the grandma?